After years of research and development, Sonoscanner is proud to introduce the Orcheo Lite,the next generation of portable ultrasound system. Designed with your needs in mind, Orcheo Lite, it is the unique combination of a highly portable platform yet being as powerful as an upscale cart based system. Because we know, you do not want to trade premium performance for portability, Orcheo Lite delivers unrivalled image quality to help you achieve clinical conﬁdence every time and everywhere. A complete host of the most advanced imaging modes makes Orcheo Lite, the versatile solution to your requirements across multiple clinical settings. 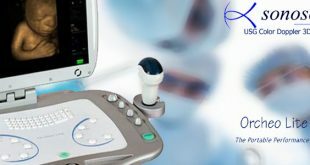 Its user-friendly and intuitive interface elevates ultrasound imaging to new levels of productivity by making your exams faster and safer. Easily upgradable and serviced thanks to its open conﬁguration, the Orcheo Lite will maintain its value for years to come and will allow you to meet tomorrow’s clinical needs. Orcheo Lite, it is truly versatility and superior image quality almost in your pocket. Setting the pace of ultrasound technology development, Sonoscanner will continue to work with you in shaping the future of diagnostic ultrasound imaging.